Hello We R fans, and happy Friday! It’s Aly here again, and I’m glad you stopped by the blog today. 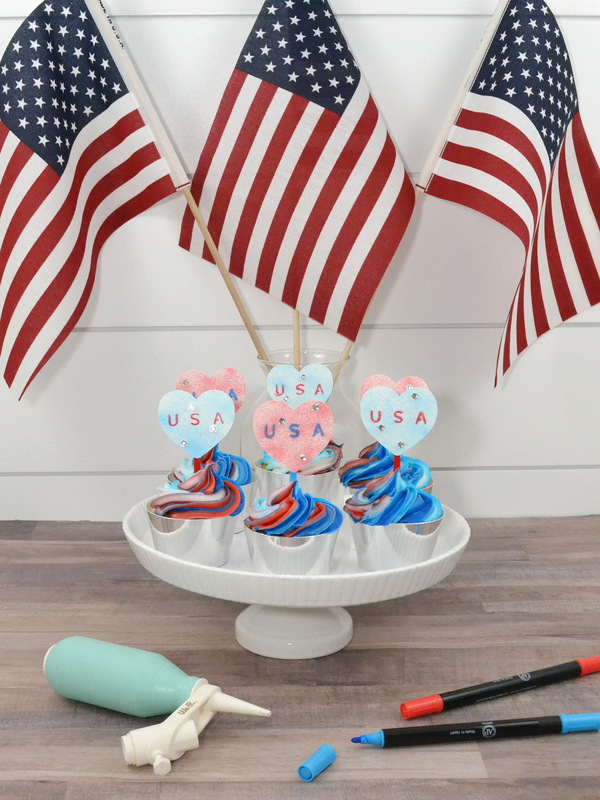 Independence Day is a holiday with special memories and meaning for me, so I’m excited to share some Patriotic Cupcake Toppers inspired by my love for this favorite time of year. 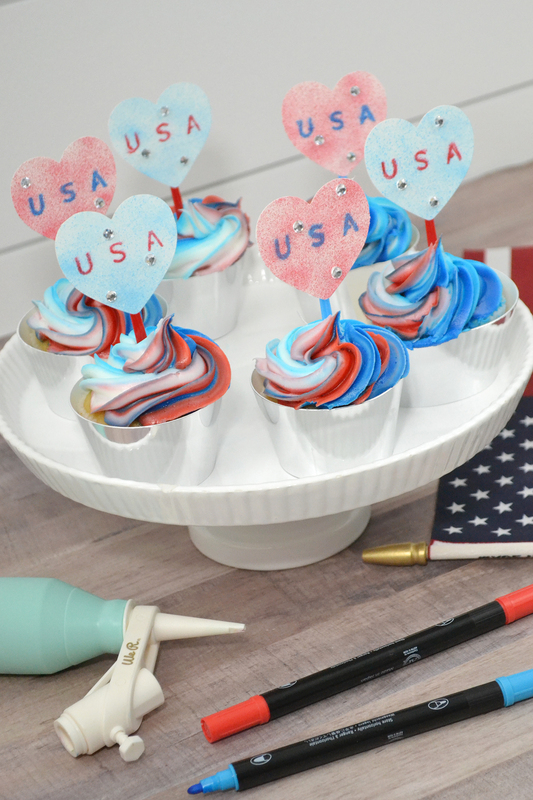 Fireworks are a big part of the Fourth of July for me and my family, so I wanted to create the look of fireworks on my cupcake toppers. Marker Airbrush to the rescue! 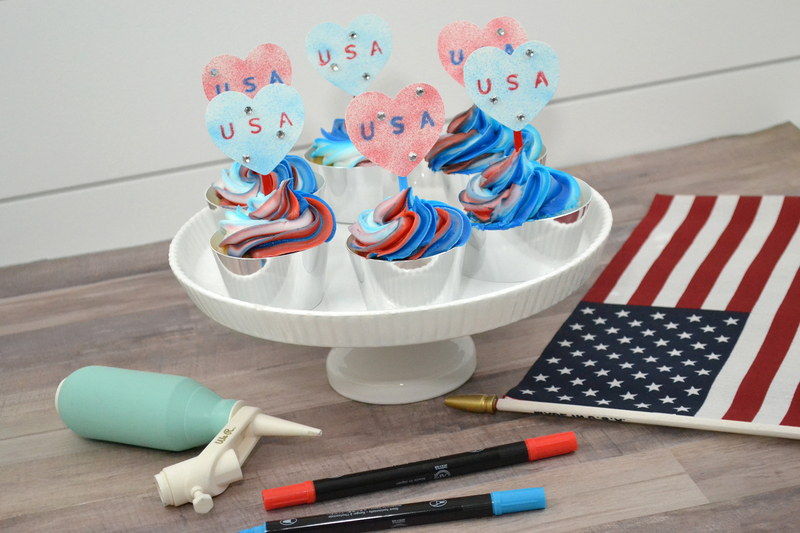 I knew I wanted to use the Marker Airbrush for the background of my cupcake toppers, so I picked out some patriotic colored markers from my stash, and created the feel of fireworks on some scraps of smooth Bazzill Marshmallow cardstock. Deciding how to add text to each topper took a bit more thought. 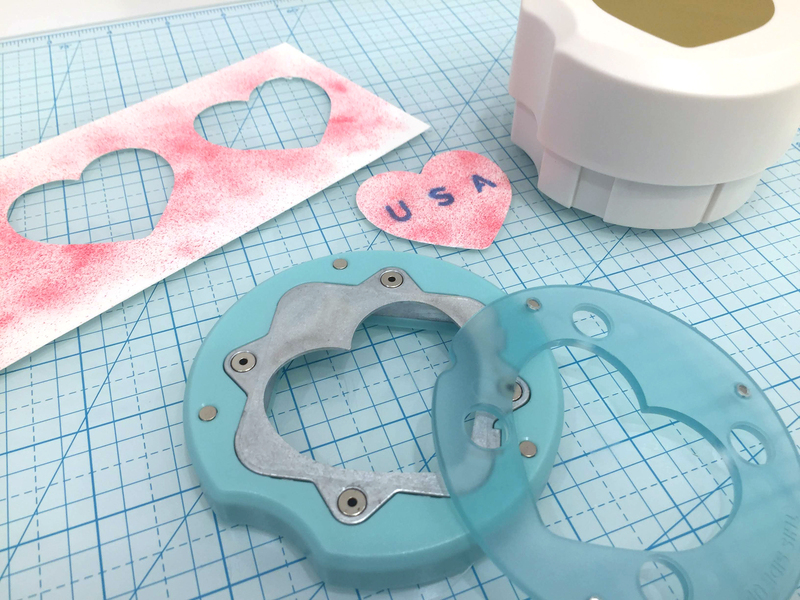 I knew it would be easy to add Thickers, or patriotic die cut phrases, but I really wanted to keep the airbrush look consistent throughout the project. Then it hit me that I could use my Word Punch Board (shipping to retailers July 2018) to create a custom template for the Marker Airbrush! 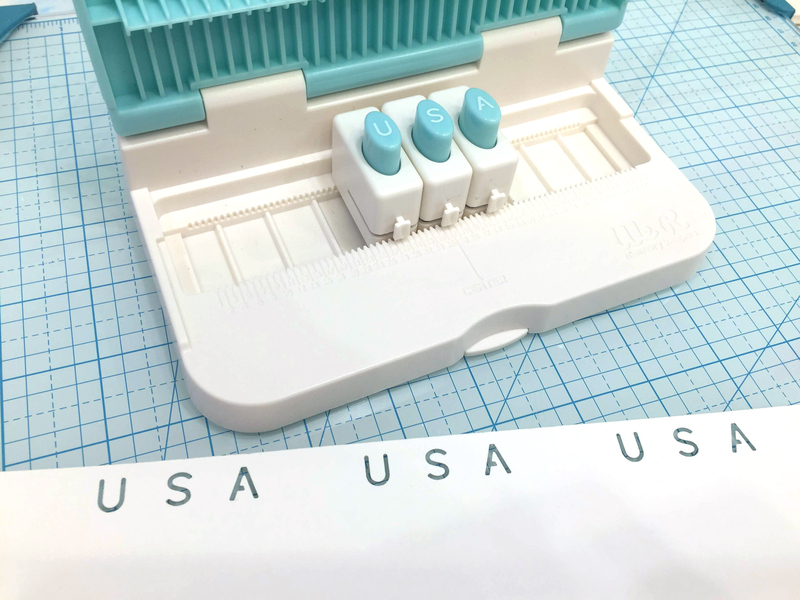 I punched out the letters “USA”, taped the template over my background (along with a little extra scrap of paper to completely cover it), and then used the complementary color with the Marker Airbrush to add the letters for my toppers. Once I finished adding the letters to the backgrounds, I punched them out with the Clear Cut Heart Punch. It was the perfect solution to portray my love for my country AND to quickly and easily punch out the text. To finish off my cupcake toppers, I added a few clear adhesive backed rhinestones for some sparkle, and then taped them to some fancy red and blue large sandwich picks. 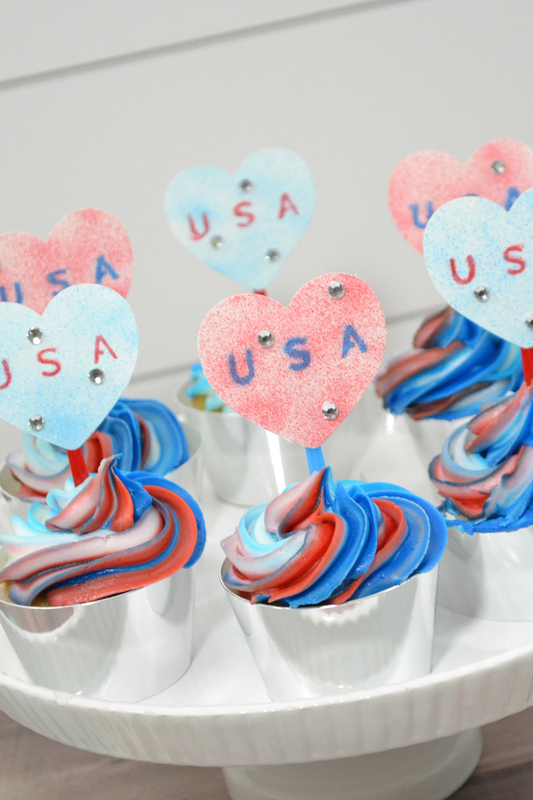 Don’t they look cool with these cupcakes with the red, white, and blue swirled frosting? 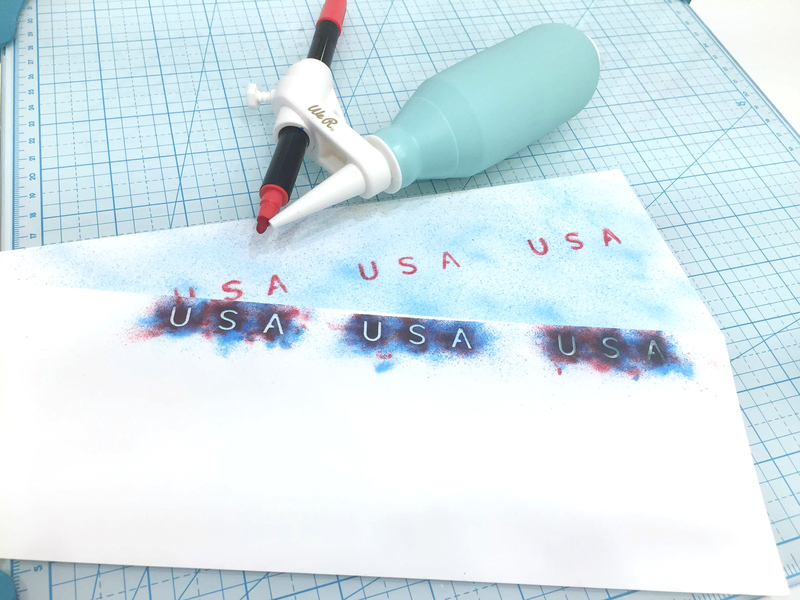 This would be a great technique to include on a patriotic greeting card, place card, or gift tag since you can easily customize the text using the Word Punch Board and the Marker Airbrush! Thanks for stopping by the blog friends! I hope you enjoy a fun, safe, and memorable Independence Day holiday this year. Happy crafting! Hello We R Fans! Kimberly here with a patriotic layout. Its no secret how much I love to stamp and with the new We R Memory Keepers Precision Press Advanced, I can stamp easily on my layouts! Yes! 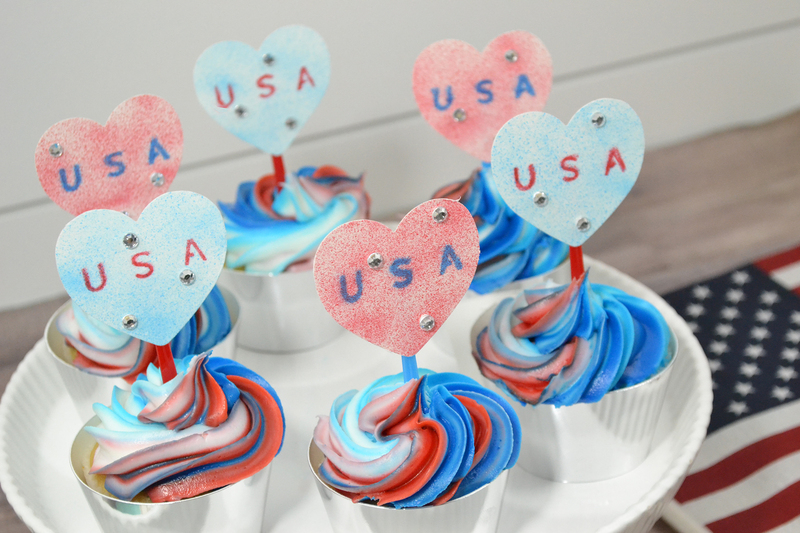 Because I did not have any specific supplies to the 4th of July, I got creative with what I had on hand. And in doing that, I created a layout I love! 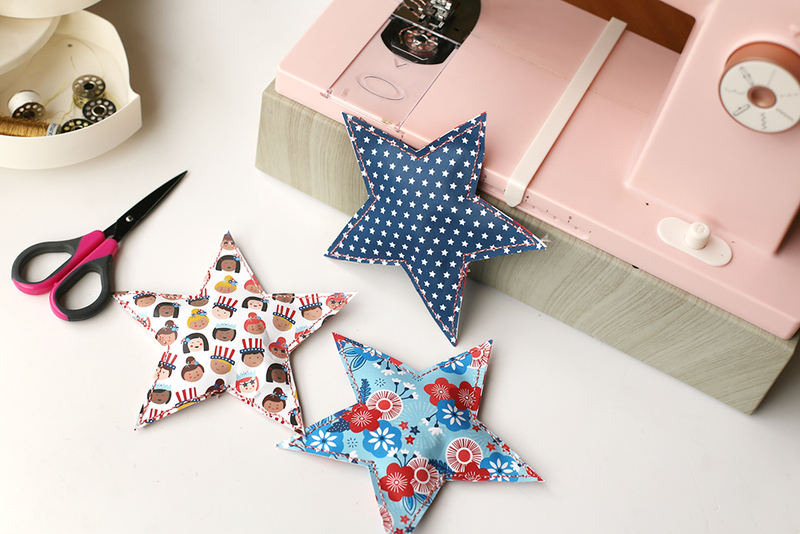 Just look at that custom star paper I was able to create! To make the custom paper, I cut a piece of Bazzill Blue cardstock to fit the top of my layout. I grabbed a star background stamp and white paint. I placed the cling stamp on my Precision Press Advanced. Notice how its only the top clear piece? You can use that piece separately! It has soft feet in all four corners allowing you to stamp just about anywhere. Paint was brushed onto my image and I stamped repeatedly across my blue cardstock. Vicki Boutin’s paints are perfect for this application as they dry quickly on paper. For the bottom of my layout, I created stripes from red cardstock using my Trim & Score Board. To help line my stripes up precisely, I used my Template Studio mat to help out. With help from the guides on the mat, I could space the stripes apart evenly and keep the lines straight. Which is good, because I not good at getting things to line up correctly. Ha! 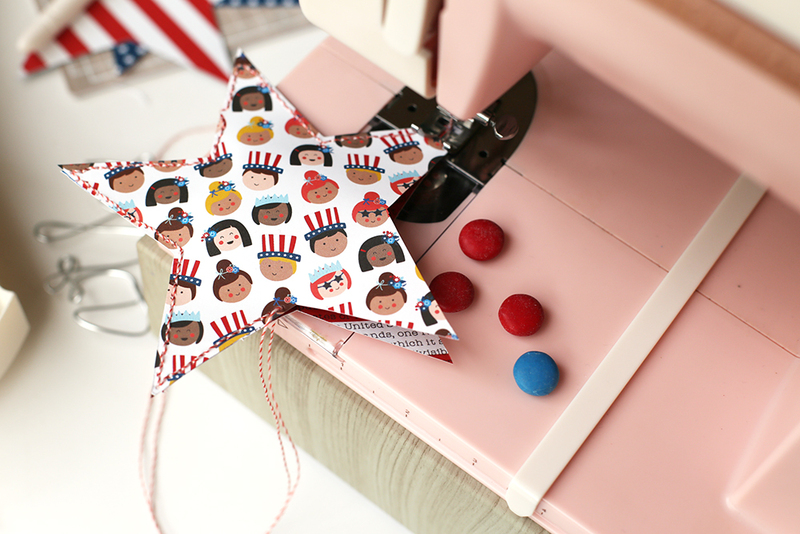 After adding a few die cut stars and other embellishments, I added a title using, you guessed it, stamps! Once again, I used the top piece of the Precision Press Advanced only. I placed my letter and number stamps directly on my layout (without inking). This way, I could line my stamps up on my project, exactly how I desired. Then I placed the Precision Press clear plate over the top, pushed down, and picked up my stamps. Then it was time to add ink and stamp for real. Oh, how easy this was! And I was not concerned about “messing it up” because I knew everything was aligned. Do you like to stamp on your layouts? Happy 4th of July! 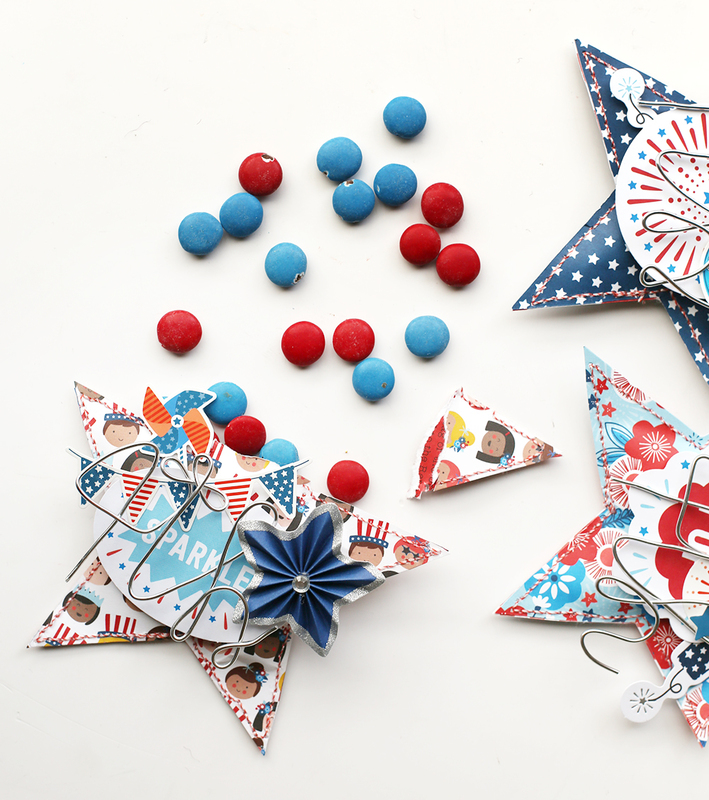 Hey there, We R friends, Laura here today with a fun patriotic garland craft you can make with just a few simple We R tools. 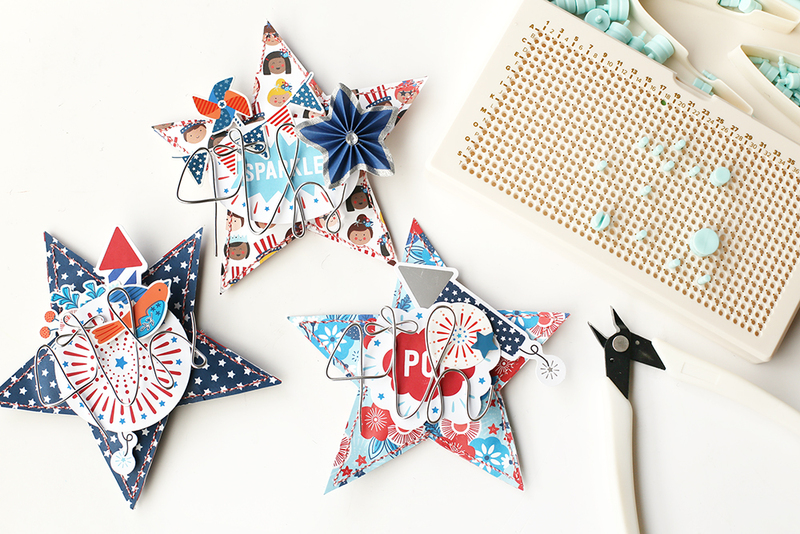 Use the mini alphabet punch board and the trim & score board to create a pretty garland banner you can use to decorate for the 4th of July or any patriotic holiday. Start by creating the rosettes. I used papers from the DCWV Nautical Mile cardstock stack. There are a lot of red, white, and blue papers in this paper stack that are perfect for this project. For each rosette, I started with an 8” x 8” patterned paper. I used the trim & score board to create score lines every ½”. Then, I cut the scored paper in half to create two sheets of 4” x 8” scored patterned paper. To create the rosette, fold the paper accordion style using the score lines as your guide. Then, fold the paper in half and use hot glue to attach the two ends. This will create a half circle. Do the same for the other paper, and then glue the two halves together with hot glue. To keep the rosette from popping apart, use the Clear Cut circle punch to create a circle in a coordinating paper. Use hot glue to secure the circle to the middle of the rosette. 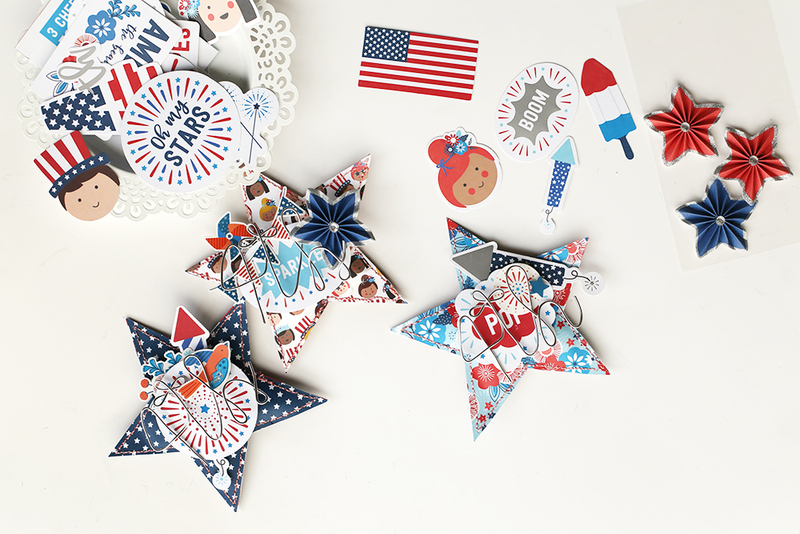 Cut out the letters ‘AMERICA’ from red, white, and blue textured cardstock using the mini alphabet punch board and the instruction book. 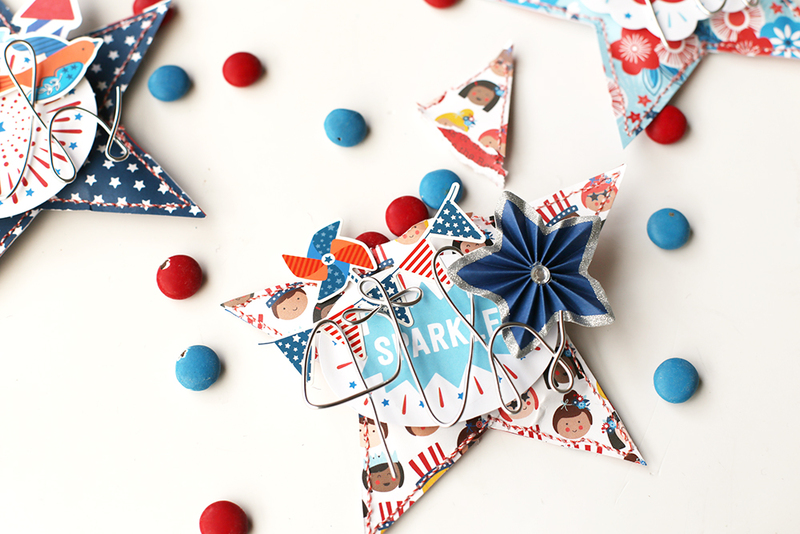 Attach them to the front of the rosettes using adhesive foam dots to give the garland a little dimension. Hot glue the rosettes to a strand of ribbon to hang your garland. I love the mix of colors and patterns on this garland. I used varying shades of blue and red for each rosette. With the red, white, and blue letters, the banner turned out very patriotic. This will make a festive and fun decoration for my 4th of July decorating. 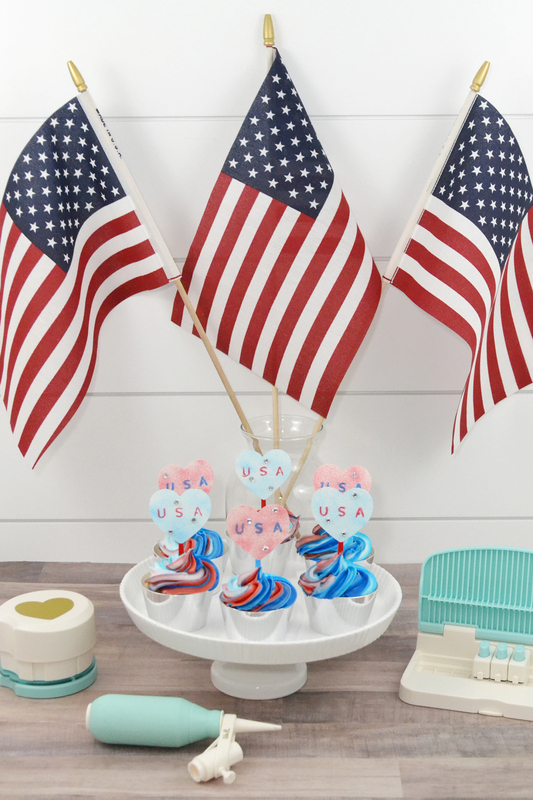 It would also be perfect for Memorial Day, Labor Day, or any other patriotic festivity you are celebrating. Good Monday morning friends! We’ve got some more exciting news for you this week. Are you ready to hear about two new releases? Great! Let’s get started. The new Gift Wrap Trimmer by We R Memory Keepers is a cut above the rest! 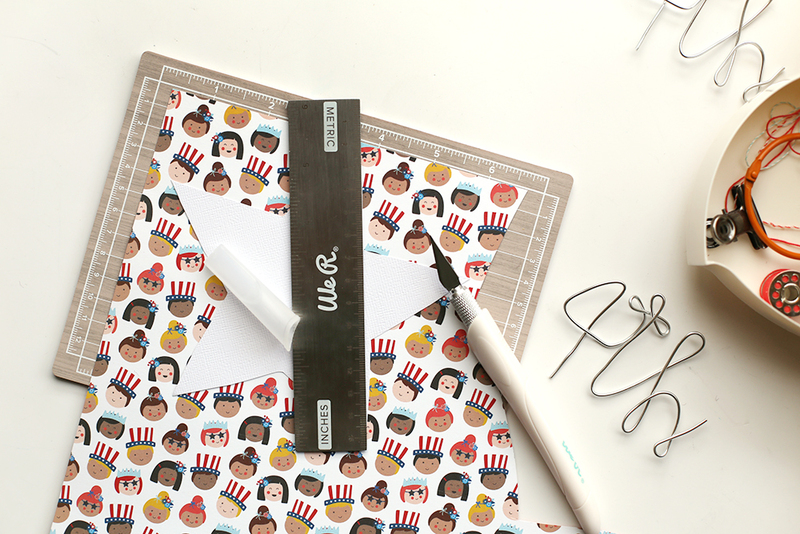 Quality blades cut wrapping paper perfectly straight and even every time. No folding, no ripping, and no scrunching! This special trimmer fits standard gift wrap sizes up to 32 inches wide, and is also great for poster boards, butcher paper, and other large format cutting. Complete projects big and small in no time with the Gift Wrap Trimmer! 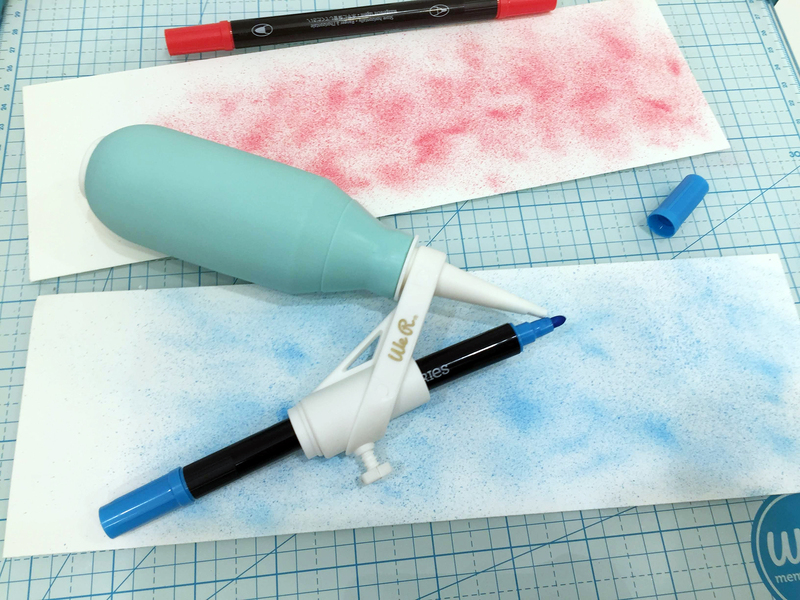 Watch the video below to see this handy new craft tool in action. You’ve already seen our Bloom Embellishment Storage in White and Mint, but now you can get it in Blush Pink! 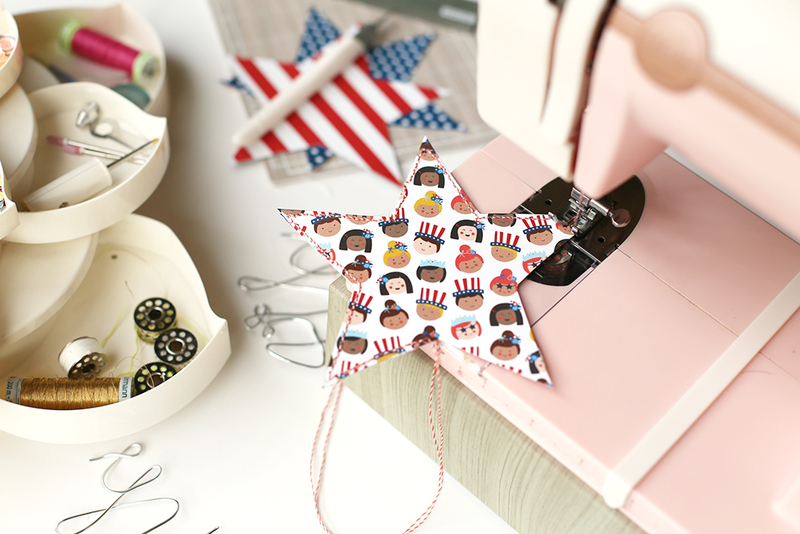 Just imagine how perfect this would be sitting on your work surface next to your Blush Pink Typecast and Stitch Happy! These new releases start shipping to retailers on July 9th, so sure to tell all your crafty friends who love pink. Thanks for stopping by. 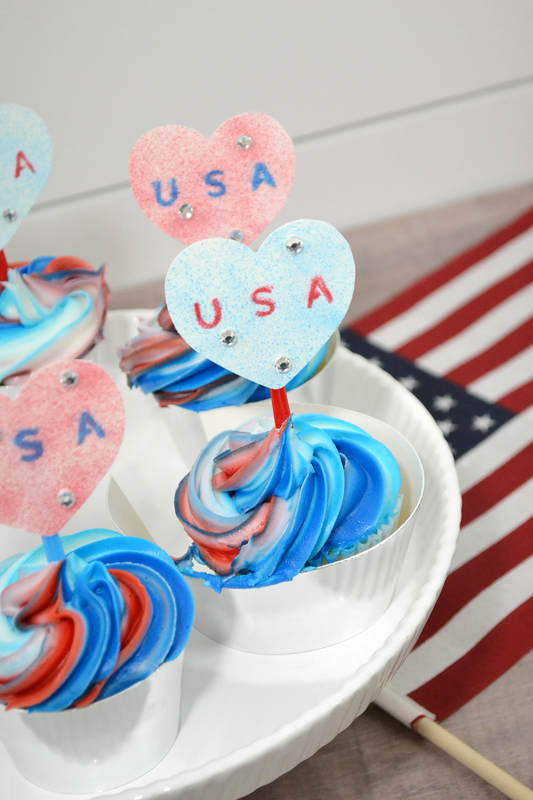 Be sure to join us the rest of the week for some patriotic project inspiration! Hello friends! Today we’re sharing a past blog project that’s one of our most popular posts for Punch Board Week. Check it out! Aly Dosdall here again to share a fun punch board project. Using the 123 Punch Board I made a coin style envelope to hold my planner accessories, and then I punched it with the Planner Punch Board to fit into my small Heidi Swapp Memory Planner. I used some beautiful paper and embellishments from the new Heart of Home collection by Jen Hadfield for Pebbles Inc. This envelope is perfect for storing embellishments, photos, receipts or other ephemera, and I love how easy it was to make with these punch boards. Honestly, I’m not sure what I did before punch boards! Ha! To make the coin envelope, I followed the instructions on the 123 Punch Board to make a 4 x 5 1/2 inch envelope. I love that the instructions for envelopes, boxes, and bows are printed on the board. So handy! I cut my paper to 8×8 inches, and then lined it up on the board at 3 1/2 inches. Then I followed the instructions to punch and score on all four sides of my paper. There’s no need to round the corners for this envelope. Instead, I pulled out my Trim and Score Board and trimmed 7/8 inch off the top, bottom, and one side of the envelope. To assemble the envelope, I added some Sticky Thumb Red Double Sided Tape to the side that I trimmed, and then folded up the bottom flap first, then the untrimmed side, and lastly the trimmed side. In order to keep the envelope 4 inches wide for photos, I added a 1 x 5 1/2 inch strip of cardstock for punching with the Planner Punch Board. I added a strip of washi tape to the front and back of the strip for added support for the punched holes and as an embellishment. Next, I added a button and string closure to the envelope. I used leftover ones from some Typecast treat bags, but you can easily make your own with a 1/2 inch hole punch, some brads (or eyelets), and some twine. Finally, I added some embellishments from the Heart of Home collection on the front and back of the envelope. I added it to my planner and filled it with some stickers, tags, die cuts, and other embellishments for my planner. I hope this Coin Envelope Planner Insert has inspired you to experiment with punch boards in your planner. Thanks for stopping by today. Happy planning! Heart of Home Collection by Jen Hadfield for Pebbles Inc. This week is all about Punch Boards, and one of our favorites is the Square Punch Board. This handy tool is perfect for planners, card layers, scrapbook pages, tags, pocketing memory keeping and other small scale projects. 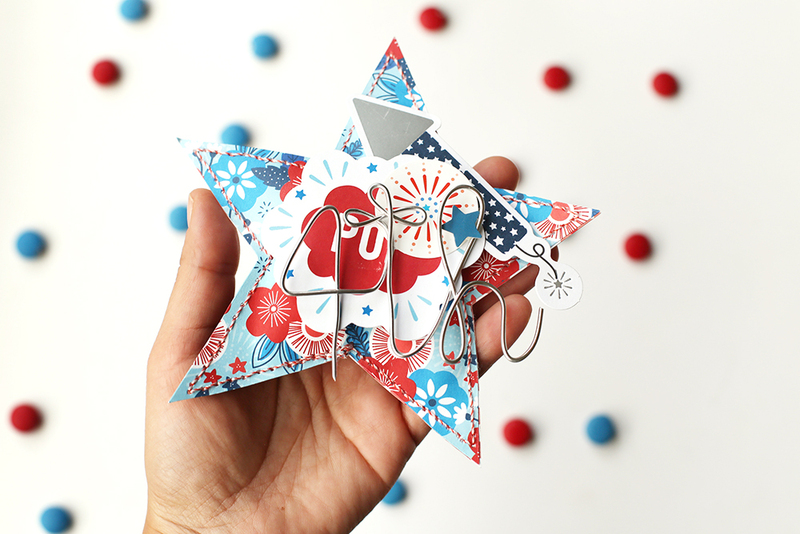 It’s great for bulk projects like holiday cards, invitations, gift tags, and more. Simply slide the guides to the desired size square or rectangle using 1/8 inch increments between 3/4″ x 3/4″ and 3″ x 4″. Then press down to punch your paper. Move your paper over until it lines up with the guide and punch again. You can punch continuously with no waste across your entire paper! The first way to use the Square Punch Board is to punch several small squares from different color patterned paper, and create a patchwork style background. You can use this technique on handmade cards, scrapbook pages, framed art, or other projects. The second way to use the Square Punch Board is to create planner squares. Most planners have multiple sizes of squares and rectangles, so the Planner Punch Board is perfect for that! You only need to buy one punch instead of three or four. The last way to use the Square Punch Board is to create a block or grid design scrapbook page. By combining different size patterned paper squares or rectangles, photos, and journaling blocks you can make an eye-catching yet easy layout that showcases your photos and memories perfectly. Thanks for stopping by. 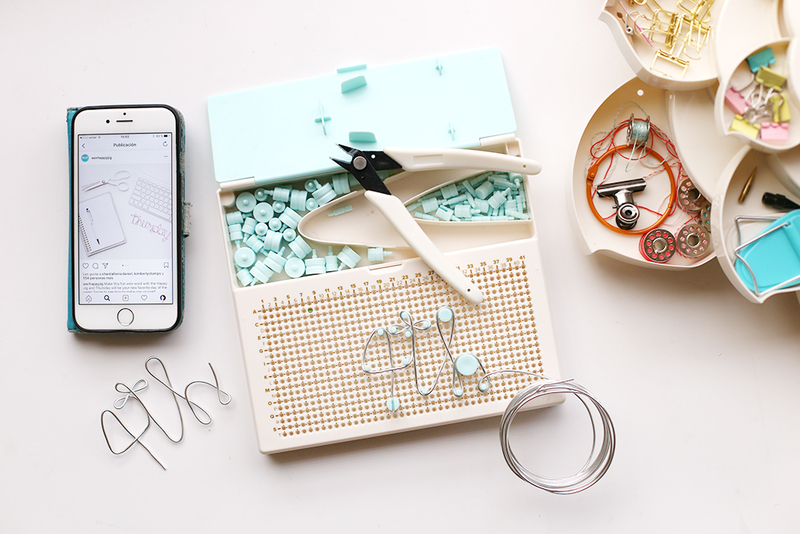 We hope these ideas have inspired you to pull out your Square Punch Board and start creating. Be sure to come back each day this week for more punch board project ideas! New Release: Word Punch Board! Hello We R friends! We’re glad you’re here today. This kind of blog post is our favorite kind, because we finally get to share an exciting secret we’ve been keeping! Are you ready? Introducing the new Word Punch Board! Punch any word with perfect alignment and spacing every time with the new Word Punch Board! This awesome tool includes 26 punches: Letters A-Z. The unique punching system allows you to punch 10 letters at one time, then replace letters to punch more words. Link the punches together for easy storage. Watch the video demo below to see this awesome new tool in action! The Word Punch Board begins shipping to retailers July 9th, 2018.